As I get back into my stride with goldmaking in WoW, I'm finding all sorts of nice opportunities to make gold on the Auction House. One of my newest earners is flipping the parts that make up the Garrison Auction House or the Ancient Trading Mechanism. Take a look at the Undermine Journal page above - it's for my server so yours may be very different but I'm sure there will be the same opportunities for you as there are here for me. The first thing I look at when using the Undermine Journal is to compare the current prices with the mean prices. You can see that on some of the component parts, current prices are way below the mean prices which signals an opportunity. I've been buying up cheap component parts and flipping them for close to the mean prices or above. Where some of the current prices are above the mean, that's probably my auctions pushing them up - I'm not being too greedy but I am a goldmaking goblin after all! My best sale so far is a 70 gold Super Cooling Tubing which sold for over 1200 gold. The other thing I look for is whether a full set of components is available to make up a full module and whether the cost of the parts is less than the module sale price. You can see that the Super Cooling Module parts would cost around 1200 gold but the current sale price is at 2500 gold - sadly there aren't any coolant components available (I wonder why! muhahaha!) so it looks like I'll be keeping that profit to myself! I've only been flipping these parts and modules but you do need to think about where they come from. The Super Cooling Module parts and the Cyclical Power Module parts come from the quest zones so they will always be the most plentiful and therefore the cheaper markets. 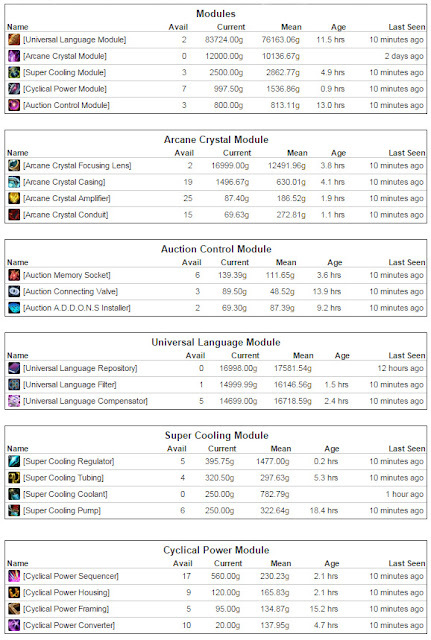 The Auction Control Module comes from dungeons which is also a cheap market due to plentiful supply. The Arcane Crystal Module parts come from raids and garrison invasions but although some of the components seem to be plentiful, the Arcane Crystal Lens is rarely seen on my server which has pushed its' price way up. The hardest module parts to get and therefore the most expensive one is the Universal Language Module which comes from Ashran. I was chatting to a fellow goldmaker in game last night who was barking in the trade channel to buy one. He didn't believe the AH price was reasonable and was hoping he could get a bargain through trade. If you like to PvP then perhaps this is not so difficult to obtain but for us PvP-novices, it seems like a million miles away from possible! Even for all that gold, I doubt I will ever really get into Ashran to fight. 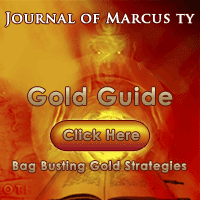 There is definitely gold to be made in this market but even after just a couple of evenings, I can see that some prices are being undercut a great deal which is bringing average prices down. I could keep buying up every really cheap component I see and I will for a little while on some of them but if the volume available is too high, I'll just be filling my bags with junk. So I'll take what profit I can for now, maybe store a few components & modules in my guild bank and keep checking back periodically to see if the prices have stabilized at all.